Imagine New Homes - What is Help to Buy? An exploration of the Government's 'Help to Buy' scheme. Help to Buy is a government scheme that’s available to you if you’re a first-time buyer who requires help when buying your first home. Consists of a low-interest loan towards your 5% deposit. It’s only available on new-build properties from a registered Help to Buy builder. The property must have a purchase price of up to £600,000 in England (and £300,000 in Wales). It must be the only home you own, it cannot be sub-let. 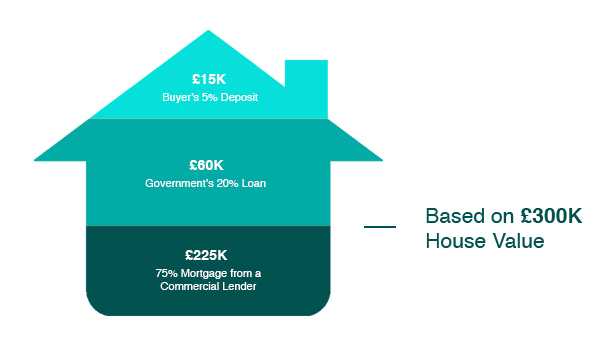 You will need to have a mortgage that is 75% of the purchase price (55% in London), and the government will lend you up to 20% (40% in London) of the purchase price as an equity loan. You won’t have to pay back the loan for the first 5 years, after which you’ll need to pay 1.75% of the loan’s value, and it will increase every year according to the Retail Price index. More information on Help to Buy equity loans. View our latest Help to Buy new-build properties, or register your details so you don’t miss out on future developments. This is when you buy a share of your home and pay rent on the rest. Your household will need to earn £80,000 per year or less (£90,000 in London). We have a selection of affordable homes under the shared ownership scheme. Visit Imagine Living to find out more. Or register your details to receive the latest developments. Find out more about buying through shared ownership. In addition to the scheme, you can also receive a 25% monetary contribution from the government when saving for your first home through a Help to ISA. When you open a Help to Buy ISA, you’ll need to save a minimum of £1,600 to qualify for the minimum government bonus of £400. For joint property purchases, both buyers can open their own Help to Buy ISA. Once you’re ready to purchase your home, your solicitor will apply for the additional 25% on your behalf. Your home will need to have a purchase price of up to £250,000 (or £450,000 in London), it must be the only home you own and it must be where you intend to live. Read more about the Help to Buy ISA. Call us on 01923 608373 and we can put you in touch with our specialist mortgage partners, who are independent, whole of market and have helped many of our customers buy their first home through the Help to Buy Scheme. You can also speak to us about the current selection of Help to Buy we have available for sale. View all the new homes we're currently marketing.